It’s time to move a Mt Dora retirement from your “To Do” list to your “Do Now” list! 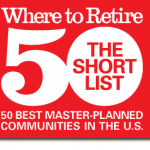 At Pringle, we believe that Mt Dora, Florida is the best place to retire! But don’t take our word for it – Mt Dora was also featured as a “Best Small Town to Retire To” in USA Today. This community in Central Florida’s Lake County has all the entertainment, shopping, fine dining and healthcare you are looking for, comfortably nestled between both the Atlantic Ocean and the Gulf of Mexico beaches. Our top-rated Florida retirement communities are located about an hour’s drive north of Orlando, putting you within a short drive to the Orlando International Airport, the major theme-parks and all the great dining hot-spots in Orlando – without all the traffic and congestion associated with living in a big city. 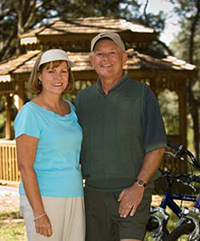 Come live the retirement you have been dreaming of in one of the best Florida retirement communities. Combining Southern hospitality with small town charm… Pringle’s flagship Florida retirement community was developed with a special vision in mind – to create a unique place where people can live in a central Florida waterfront home with classic Florida architecture near one of the most impressive small towns in the country. Most custom home sites are waterfront or water view, and available to suit a wide variety of home designs. The nearby town of Mount Dora is nationally known for its charming waterfront ambiance and gracious lifestyle including dozens of specialty retailers, year-round festivals and events, and historic architecture. Uniquely, this premier retirement community has been designed to provide waterfront access or water views to over 75% of the residents. The Lakes of Mount Dora is fully gated, and features Florida ecologically friendly landscaping-another Pringle exclusive. All homes are ENERGY-STAR® certified to ensure years of savings for both you and the environment.